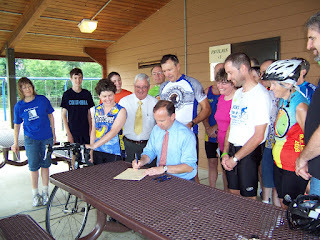 Surrounded by cycling fanfare, Governor Carney signed the Bicycle-Friendly Delaware Act into law this afternoon in Newark. Our critical analysis of HB-185, both pro and con, was posted on June 21. We will not discuss it any further here, except to say that at least one valuable opportunity was lost. In their usual secretive manner, Bike Delaware crafted something with zero input from fellow advocates or anyone else in DE's bicycling community. Sad -- but expected -- it takes another source or article (here, Bicycling Magazine pens Carney's signature a day early) for some of the finer and more sought after details to emerge. Clearly, the Idaho Stop (rolling, yield stop) provision was the main goal of the bill, with most of the rest intended to diversify the language and limit discussion on the floor. The best chance at passage came by circumventing a prolonged debate that killed the Idaho Stop in other States. It was a brilliant move and it worked. None of the new rules will have an impact, however, without public awareness. Bike Delaware aims to launch an educational campaign across the state, while Whitmarsh said officers will get a chance to read the new laws and ask questions at upcoming training sessions. He also said the department will promote the changes to the press. Bare, who took the lead on crafting the legal language of the bill, said making sure drivers, cyclists, and police understand the law is essential to its success. “There is no limit to the number of ways that something like this can fail,” Bare said. Starting the conversation before the rollout, he said, gives the state a head start. We hope Bike Delaware stays true to their word above. But in order to do so, they will need to break from their usual pattern of secrecy and provide regular updates on how their PR campaign is progressing. Laws and changes to laws are completely useless if the public is unaware of it, except maybe after a crash (if the victim is still alive, knows about it, and can cite it to the judge). 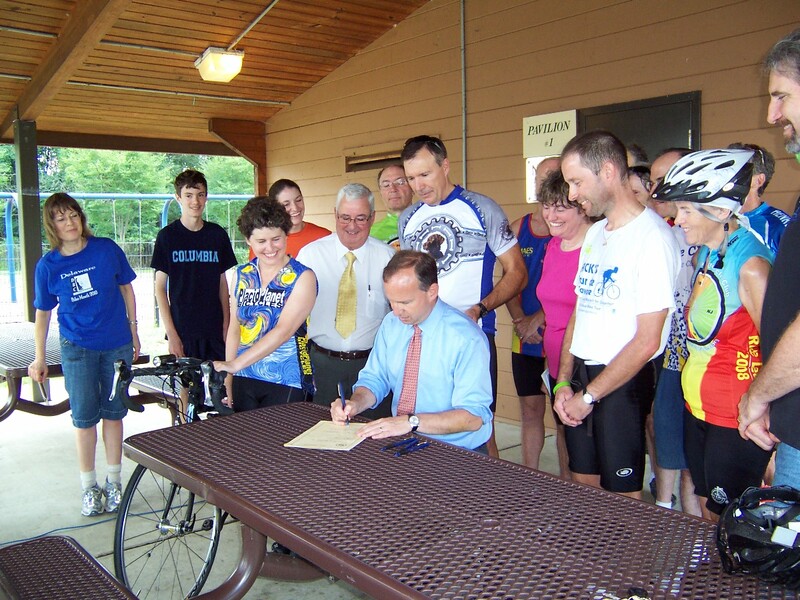 If an effective PR campaign is achieved, Bike Delaware will deserve much in the way of kudos for moving the State forward in a more bicycle-friendly direction.